Having an active toddler is a great thing, but sometimes it doesn’t feel that way. What you need, tired mama, is some high energy toddler activities. What your toddler needs is some toddler fun: physical activities that toddlers love that will keep them out of trouble and tire them out before bedtime rolls around. Ah, I can just imagine how much easier bedtime will be once I tire my toddler out. Instead of trying to get your toddler to calm the heck down, you really should embrace their need for physical activity because it helps to build a healthy body. Psst! Check out our carefully curated BEST “Indoor Toys That Keep Kids Active” List on Amazon. This list is full of easy, low-prep toddler activities and games that you can do at home that will tire your toddler out (because we’ve all asked the question “What do I do with my toddler all day?”). I refer to this list frequently, because I’m always wondering how to entertain my toddler indoors. Have older kids too? Kids of all ages will enjoy these activities for kids with high energy. 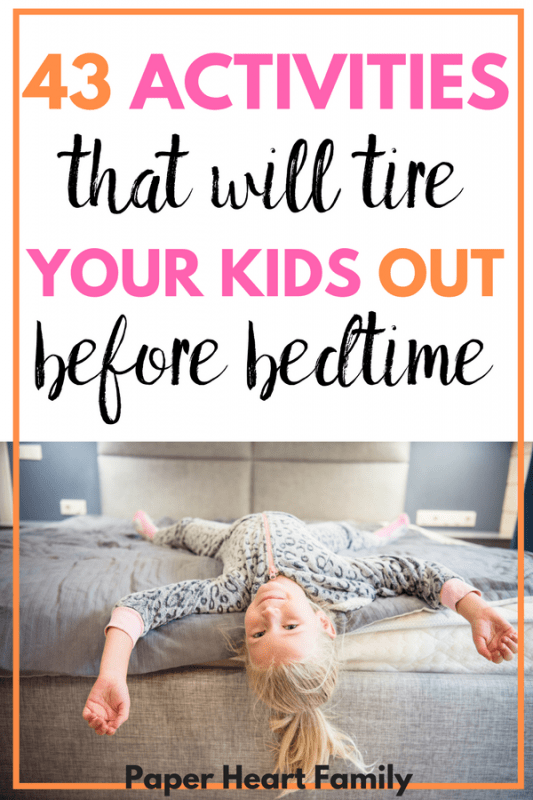 If your toddler still naps, but struggles to fall asleep at bedtime, keeping them active is necessary to ensure that you get some mama-me time at the end of the day. These activities are perfect for older kids, too. 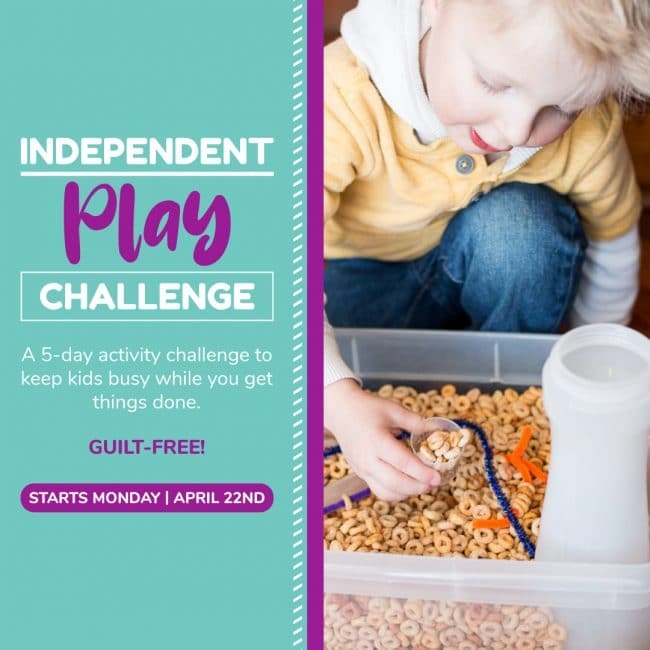 Hands On As We Grow has an amazing, FREE 7-Day Activity Challenge that I did this winter with my kids. You get a new email each day for 7 days explaining a super simple, low-prep and FUN activity, perfect for toddlers and preschoolers. My kids loved every activity. We love the Disney Jr Super Stretchy game which puts an educational twist on Twister, and helps your toddler to practice shapes and colors while being active. Dr Seuss’ I Can Do That is another game that gets your toddler moving by giving your toddler a challenge, such as “hop to the bathtub with the fish under your chin”. We have this foldable mattress that we bought to use when our niece comes over. It is hands-down my children’s favorite toy. And it’s not even a toy. They have played with this thing for hours and hours and hours. They make forts with it, they jump on it, they put it on the couch and do gymnastics with it. If you don’t have one, your kids would equally love an air mattress, the couch, a bed, an old crib mattress, etc. If you don’t feel like blowing bubbles for your toddler for hours on end, make sure that you get a bubble blower that your toddler can control. Why not teach your toddler to recognize the ABCs while they’re running around the house? Incorporate letter learning into fun games like Musical Chairs, Relay Races, Kick The Can and more with these no-prep active learning activities. Remember playing parachute in gym class? Even if you don’t have the real deal, you can simply use a round tablecloth, place some balls on it, and have your kids shake the parachute and run to collect the balls. If you have a laser of some kind, get comfy on the couch and shine the laser on the floor and have your kids chase it and try to “catch” it. Does it sound like something you would do with your cat? Yep. But who cares. Your kids will LOVE it. My kids do! The hot lava game is seriously amazing and is one of the best high energy toddler activities. You can use whatever you want for the “land” (pillows are always a hit). Spread them out on the floor and have your kids jump from pillow to pillow, trying to avoid the floor that’s covered in hot lava. However, if you’re tired of having to buy new pillows all the time because your kids flatten them (like I am), check this out! You could have your kids do the crab walk, wheelbarrow race, bear walk, three-legged race, egg and spoon race or sack race. Since my kids are different ages, I don’t have them race, I simply have them try to beat their personal best score. I love this variation of the wheelbarrow race that incorporates a peg board puzzle. Monster in the Middle is our version of Monkey in the Middle. Calling the person in the middle a monster instead of a monkey just makes it more fun, and gives that person a little more freedom to move from the middle (and to make scary monster noises too). This is one of the best gifts that my kids received. It gets daily use in my house. It’s perfect for the winter months when we can’t get outside and It’s the perfect size for your kid (and your house because it doesn’t take up a ton of room). Kids love music and dancing, so it’s no surprise that music videos directed toward kids are becoming so popular. My kids love dancing along to The Dinosaur Stomp, Whip, Nae Nae and this awesome playlist of kid’s choreography from Saskia’s Dansschool. Crank up your kid’s favorite music and dance along with them! Create an indoor obstacle course using whatever you have around the house (your kids will be able to find lots of obstacles to use). Check out this post with 30 awesome ideas to get your kids outside. If you have a toddler, this bike is amazing. It’s great for toddlers because when they get tired out, you can push them along. My daughter even loved it before she was old enough to reach the pedals and became insulted whenever I put her in the regular stroller instead. This is a great post with lots of different tag game ideas. Blow up a balloon and see how long everyone can keep it up in the air. Having a clean up race is lots of fun. If I want my kids to clean up a room fast, I turn on a fun, upbeat song and I tell them that we have to finish cleaning up before the song ends. You could also play this specific song and have your kids try to beat the Clean Up Robot. Have your child put on a show for you, showcasing all of their tricks or dance moves. My kids love having dress up parades. They make me stay in the living room while they get dressed up, then they walk through the house like they are in a parade. Tuck a jump rope into a couch cushion, then hold the other side. Keep raising the rope as your kids jump over it. If my kids are having trouble occupying themselves, I might do a yoga workout. Usually they join me! If your toddler loves to dance, these ribbon wands will really get them moving. Roll out a big piece of paper on your floor and write whatever your child is working on learning on it. It could be shapes, letters, numbers or sight words. Call out the object that you want your child to jump to. And if you’re really feeling creative, you can create a DIY paper airplane target. Side note: I wish they made one in my size. This is another one of the best investments that I’ve made, and it’s so cheap! My 5 year old still uses it all the time, but what’s really great about it is that my kids started using it at a year old. It’s a toy that will be played with for years. Why not have your kids burn their energy and help you clean at the same time? Give them a spray bottle of water and a rag. Who knew cleaning could be so much fun? My 2 year old has a Duck Duck Goose obsession. We play it a little differently though. We don’t say “duck, duck”, we instead say silly things like “stinky feet” and “tasty cupcake”. It’s so much fun to hear what silly descriptions my kids come up with. Have a cheap wind up toy laying around? Wind up the toy, set it down, and tell your child that it’s going to get them. I love these sensory Animal Walk ideas. It sounds difficult and time consuming, but it’s totally kid-led. Check it out here. My friend Jaymi over at The Salty Mamas recommended this. It’s a great way to get your kids to hop like bunnies, run like cheetahs and fly like birds while you sip some (still hot) coffee. And don’t forget to get some calming activities in before bed. Alexandra from Coffee and Coos dims the lights and does a calm activity with her toddler for 30 minutes before bedtime. 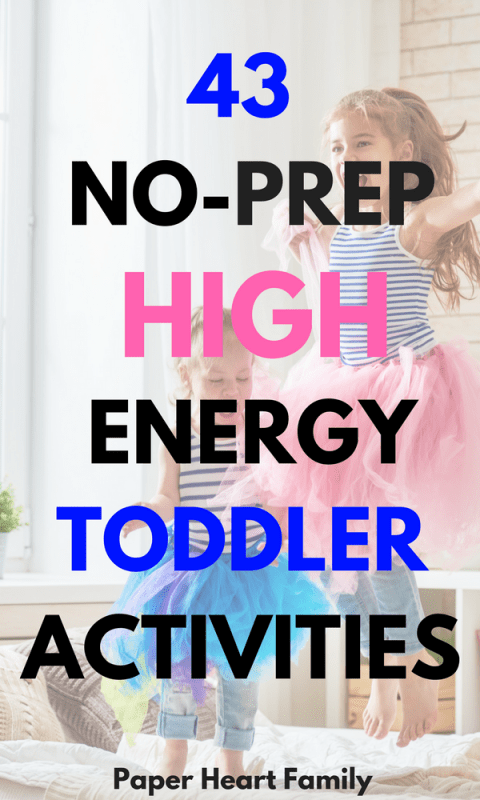 Love these high energy toddler activities? Check out 22 Ways to Keep a Toddler Engaged, Busy and Out of Trouble! What are your kid’s favorite energy-burning activities? These are really good! I have a newborn and 2 toddlers. Looking for activities we can do while I’m holding the baby, or nursing. Anyway, great post! Thank you so much Haley, I’m glad you like the activities! I remember the days of nursing a baby and entertaining a toddler ? 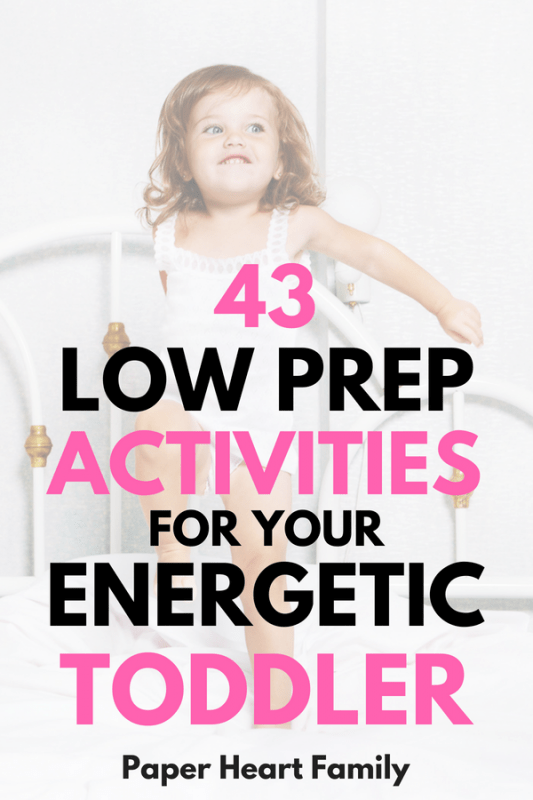 So many fun ideas to help get the energy out of little ones before bedtime. We love that Cat in the Hat card game. And our couch has certainly seen some jumping over the years.